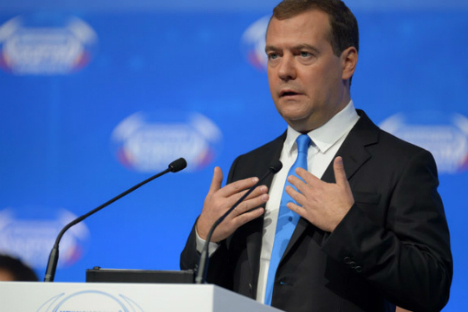 Turkey’s actions basically made it clear that the country protects ISIL, Dmitry Medvedev said. Russian Prime Minister Dmitry Medvedev has slammed Turkey’s downing of a Russian Su-24 Fencer bomber over Syrian territory, calling it a "reckless criminal act" that will worsen relations between Russia and NATO and shows that Ankara is protecting the Islamic State (ISIL) terrorist organization. "The recklessness of the Turkish authorities’ criminal actions of downing the Russian airplane has led to three consequences. The first is the dangerous worsening of relations between Russia and NATO that cannot be justified by any interests, including the protection of state borders," the Russian prime minister said. He added that the second consequence was a demonstration of Turkish intention to protect the ISIL militants. "Turkey’s actions basically made it clear that the country protects ISIL. This is hardly surprising, considering the reports that certain Turkish officials have a vested interest in cheap oil supplies coming from the Islamic State," Dmitry Medvedev said. "And third, the undermining of long friendly relations between Russia and Turkey, including in the economic and humanitarian spheres. This damage will be difficult to compensate, and its immediate consequences could turn into the refusal of a range of important joint projects and the loss of positions by Turkish companies on the Russian market," Medvedev said. On Tuesday, a Russian Su-24 jet crashed in Syria. Russian President Vladimir Putin said that the plane was downed by an air-to-air missile launched by the Turkish F-16 jet over Syrian territory, and fell 4 kilometers (2.5 miles) from the Turkish border. One of two Su-24 pilots was killed by fire from the ground after ejecting from the plane and a Russian naval infantry soldier was killed during the rescue operation. Turkish President Recep Tayyip Erdogan said that Turkey acted in line with its sovereign right to respond to threats, claiming that the Russian jet had violated Turkish airspace.